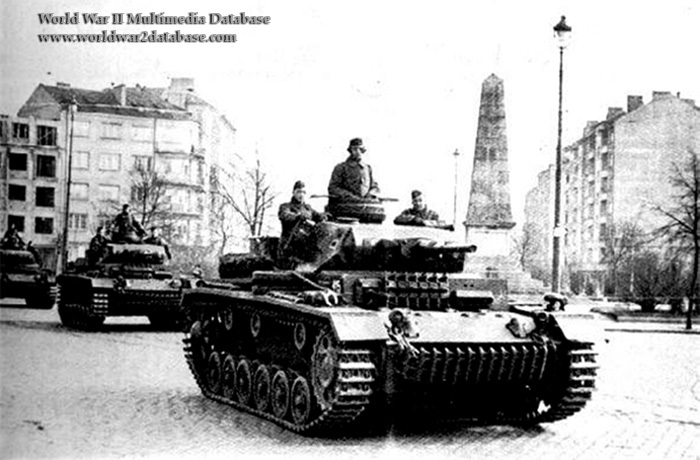 Panzerkampfwagen III ausf G followed by an ausf H model moves through the city the day before the German invasion of the Balkans. The ausf G version was upgraded in mid-production with a 50mm gun. Earlier versions were retrofitted with the 50mm. The ausf H added better armor to defeat the British 2-pounder (40mm), the American 37mm and the Russian 45mm antitank guns. The pzkpfw III was reliable, relatively fast, and arguably the best tank of the first half of the war.